Vienna Museum: "The Ring - The Boulevard’s Early Years, 1857–1865"
The exhibition in the Vienna Museum spans the period from the beginning of planning to the construction of the Ringstrasse in 1857 and its festive opening on 1 May 1865. Plans, designs, models and photographs are put on display for the first time. They tell of architects, painters, and sculptors searching for the style of their age. They illuminate the juxtaposition of demolition and new construction. 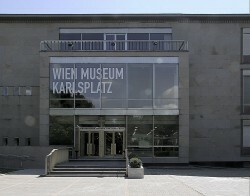 The Vienna Museum unfurls the planning phase of the Ringstrasse, up to its opening in 1865. When the Ringstrasse was first opened, very little was in a finished state.